PlexiDor dog and cat doors - simply the best insulated and strongest pet doors on the planet! Made in the USA. 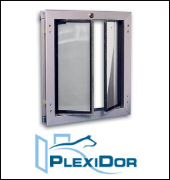 PlexiDor dog and cat doors - simply the best insulated and strongest pet doors on the planet! 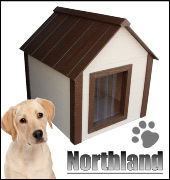 We specialize in quality insulated wood dog houses, cat houses, dog kennels, dog doors, dog breeder kennels, dog runs, and modular pet containment systems. Whether you own just a single dog or if you are an active breeder or professional kennel operation, we have products to suit your needs. 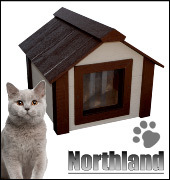 We are a leading manufacturer of insulated wood dog and cat houses. Classic design and modern materials meet to create the world's best insulated, most weather resistant, and most comfortable pet house. Each house features our patent-pending PanelAbode laminated engineered panel system with simulated rough-sawn cedar finish. This technology makes our houses more durable and dimensionally-stable than traditional cedar pet houses, with superior scratch, dent, warp, moisture, and insect resistance. Of course, you can expect all the premium features you'd find in any quality pet house including raised feet, heavy duty offset vinyl flap doors, vented ridge cap, and our patent-pending Slide-Lock removable roof system (no tools necessary!). All of our houses are pre-finished and ready for assembly in less than 10 minutes. Free factory-direct shipping in the U.S.A. and Canada. 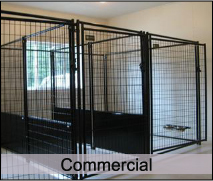 We are also a leading supplier of modular dog kennels and runs. We offer free shipping on all kennels within the U.S.A. and Canada. 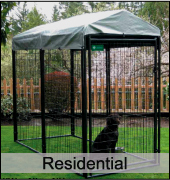 Using our convenient 4' and 5' wide modular galvanized steel kennel panels, you can quickly build dog kennels, dog runs, dog pens, or enclosures of almost any shape and configuration!